Destination: The Mad River Valley, Vermont. Located midway between Stowe and Middlebury on Vermont’s scenic Route 100, is quintessential New England offering classic old-world charm complete with steepled churches and picturesque mountain villages – an ideal choice for your Vermont vacation. Please share your Mad River Valley comments. To feature your VT business, contact us. 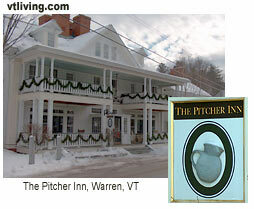 Waitsfield, Vermont serves as the Mad River Valley’s downtown district and is home to a multitude of dining venues, inn lodging and vacation rental accommodations. You’ll also find shops, galleries, and nightlife destinations. Some of the finest dining in Vermont is found among the area’s 30 restaurants, along with an outstanding selection of country inns that offer friendly and personalized service. The Mad River Valley Byway travels on Vermont’s scenic Route 100. Take a leisurely ride along Route 100 to experience all the Mad River Valley has to offer. From scenic farms to unique stores – you will find a new surprise around the next corner. Enjoy the video below for a sample of life in the Mad River Valley of Vermont.